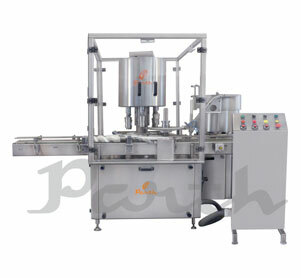 A more enhanced version of screw capping machine, Pick & Place type screw capping machine additionally consists of a rotating head and a cam to pick up the cap and screw it on top of the bottle. Our offerings include pick & place type screw capping machine with varying production rates as per the requirement. The powder coated M.S structure provides it the strength as well as protects it from corrosion and wear. The pick and place screw capper machine comes up with a torque adjustable arrangement giving the option of running at various torque levels as per the necessity. The output range varies from 2400/hour to 12000/hour.